This tour is called Ultimate Rajasthan, but in many ways Rajasthan is ultimate India. Your visit begins in Delhi, where the broad avenues and grand edifices of the colonial British contrast with the hectic old city. Then you continue to one of the world’s most emotive sights; the Taj Mahal at sunset. From Agra you journey to the Pink City of Jaipur, so named because of the rosy hue of its buildings, with its glorious palaces. Then it’s on to Jodhpur set amidst the burning sands of the Great Thar Desert. You’ll also experience Rajasthan’s dramatic scenery, rugged countryside, unchanged villages like Narlai and breath-taking cities like Udaipur. Take an evening flight from London Heathrow to Delhi arriving the following morning. You’ll be met at Delhi airport and taken to your hotel – an oasis within the sprawling city and the perfect base for making the most of Delhi’s exciting sightseeing opportunities. Your chauffeur and guide will show you the Moghul Red Fort and Jama Masjid – India’s largest mosque – and the beautiful park of Raj Ghat where Gandhi was cremated. You’ll also visit the hectic Chandni Chowk market. Next day you’ll be guided through the broad avenues, stately homes and landscaped gardens created by British architects like Sir Edwin Lutyens. You’ll visit Humayun’s Tomb and the Qutab Minar before driving along Raj Path, past the imposing India Gate, the Parliament building and Rashtrapati Bhavan, the President’s residence. Stay: Two nights in a manor room at The Manor. Today the new expressway whisks you to Agra, the city that epitomises the art and architecture of the Mughals. India’s capital in the 16th and 17th Centuries, Agra offers the imposing Agra Fort, the white apartments of the Emperor Shah Jehan and of course, the Taj Mahal – the highlight of any visit to India. Seeing the Taj Mahal at sunset is unforgettable, but Agra also features the Tomb of Itimad-ud-Daulah, or ‘Baby Taj’, considered to be the forerunner of the Taj Mahal. Stay: One night in a Mughal room at ITC Mughal. Now the City of Victory awaits. But on your way to Jaipur you’ll stop at the deserted Moghul city of Fatephur Sikri. Built in the late 16th century it was abandoned after 15 years and stands today in near perfect condition. It’s a fitting prelude to Jaipur, where you’ll be surrounded by rose coloured terra cotta buildings, bazaars that teem with people, camels, horses and vehicles, magnificent palaces and ancient mansions. You’ll be taken on a tour of the Palace of the Winds and Amber, the ancient capital of the region, where you can ride an elephant through towering gateways to the main Palace and beyond to the hilltop fort. In the afternoon you can visit Maharaja’s City Palace, the Observatory, the Albert Hall Museum, Ram Niwas Gardens and the monumental buildings that gave Jaipur its reputation as the Pink City. Stay: Two nights in a deluxe room at Samode Haveli. Today you journey to Chhatra Sagar – a beautiful oasis in the heart of the Rajasthan countryside – for nature walks, birdwatching beside the lake and a sunset campfire and dinner. You’ll be staying in an original hunting lodge that now features 11 ultra-luxurious tents overlooking the magnificent lake. As well as unsurpassed birdwatching and enthralling jeep safaris into the surrounding countryside, Chhatra Sagar is known for serving some of the finest Rajasthani home cooking in the state – completing an authentic experience of rural Rajasthan. 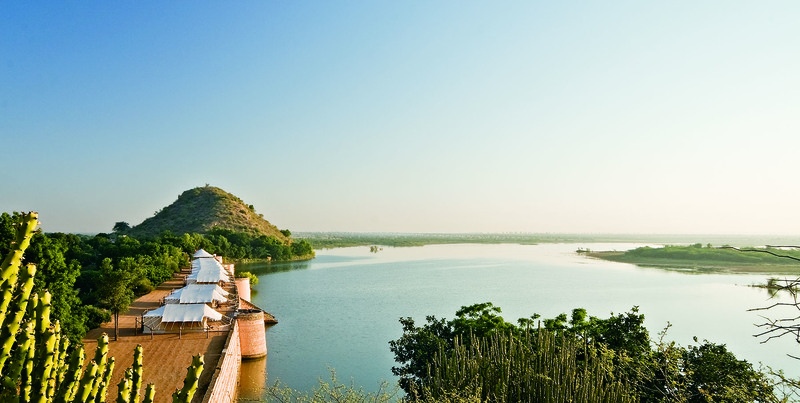 Stay: Two nights in a luxury tent at Chhatra Sagar. A scenic drive of about two and a half hours brings you to a city founded in 1459 AD, rearing out of the sands of the Great Thar Desert. Once the epicentre of the flourishing Kingdom of Marwar, Jodhpur rejoices in a fine collection of palaces, forts and temples. Your sightseeing tour will include the Mehrangarh Fort; a five kilometre complex adorning a near-perpendicular hill. You’ll wander around an intricately decorated red sandstone palace with a museum featuring palanquins, howdahs, royal cradles, miniature paintings of various schools, folk music instruments, costumes and impressive armour. Also unmissable is the marble memorial to Maharaja Jaswant Singh II built in 1899. Stay: Two nights in a luxury fort view room at Raas. Four hours will pass in a blink as you drive through the picturesque Aravalli Hills bringing you to Rawla Narlai. Hidden away in a small, 17th century village, deep in the heart of the Aravalli Hills, this hotel stands at the foot of a huge, granite rock. The surrounding countryside is a snapshot of richly forested hills and dramatic rocky outcrops, giving you a privileged glimpse of a Rajasthan that few of today’s visitors see. It’s one of the most beautiful parts of the state, and as impressive in its own way as the more-visited grand temples and palaces. It’s also a place where you can feed monkeys as they come down the hill, as prayer offering to Lord Hanuman. You can also take jeep safaris and visit an ancient step-well. Stay: Two nights in a grand heritage room at Rawla Narlai. Today you wind your way through the rugged hills of Rajasthan, to the massive 15th century fort at Kumbalgarh – one of the most impressive in the ancient Kingdom of Mewar – embracing temples and palaces within its walls. Outside the walls is a wildlife sanctuary with wolves, leopards and flying squirrels. Next come the Jain Temples of Ranakpur featuring the Chaumukha Temple, built in 1439, with 29 halls supported by 1444 marble pillars, each one different. Then you arrive in Udaipur – City of Dreams – a romantic symphony of white marble palaces, placid blue lakes and green hills – a colourful contrast to the stark and arid countryside. You’ll be staying in a lovingly rebuilt hotel overlooking the city. This is an ideal base for tours that take you to the Jagdish Temple – noted for its elephant motif carving – the 1567 grand City Palace with its crenulated walls, triple arched gate, collection of major palaces and minor palaces, courtyards, corridors and gardens. You’ll also visit the Crystal Gallery with its rare collection of crystal chandeliers, chairs, dressing tables and a bed. In the afternoon you can take a boat ride on the lake. From Udaipur you fly to Delhi to meet your connecting flight back to London, arriving in the early evening.